Boating accidents in Boston and elsewhere are likely, especially during this time of the year! According to New England officials, a 41-year-old father and his two children, 5- and 3-years-old, were in a pretty serious accident in a New Hampshire lake. The Boston Globe reports that the father throttled up the motor and shifted his weight. The boat listed heavily and ejected him. The father was injured by the boat’s propeller is it circled the area. During the incident, he say that his son’s life jacket was caught on a part of the boat. He lifted the outboard motor to free him. He was also able to get his daughter off of the boat before it sank. A pontoon boat that was passing by was able to swoop in for the rescue. According to officials, the outboard motor was never intended for a craft of that size. Our Massachusetts boating accident attorneys understand that boating is getting more and more dangerous. Nationwide, the number of boating fatalities remains high. Accident and injury stats are up there, too. In 2006, about 70 percent of the more than 700 boaters who were killed in accidents were on vessels captained by those with no formal boating training. Many of these accidents were caused by excessive speed, recklessness and operator inattention. 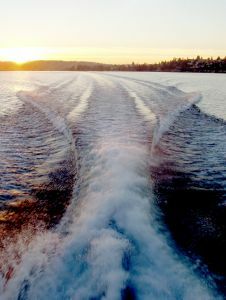 The most common cause of boating accidents is alcohol. Alcohol-impaired drivers account for about 20 percent of those involved in fatal boating accidents. These are all extremely common happenings in the New England area, too. Accidents have been all too common in the recent months, since we’ve had such warm weather. Residents and visitors are flocking to the water and enjoying the summer season to the fullest. In 2008, there were nearly 15 people who were killed in boating accidents in the state of Massachusetts. That’s up from the 9 fatalities recorded in 2007. None of these accident victims were wearing a life jacket. Our state has close to 1,500 miles of coastline, hundreds of lakes and ponds, four major river systems and the Quabbin Reservoir. If recreational boating is your thing, Massachusetts is the place to be. But be careful, there are about 100 officials with the Massachusetts Environmental Police (MSP) that are patrolling our waterways from the Berkshires to Cape Cod. To help to keep boaters safe, officials with the MSP recommend that all boaters under the age of 12 to wear a personal flotation device. Just like driving a car, you’ve got to keep safety as a top priority when in a boat. If you’ve been injured in a boating accidentm, contact the Law Offices of Jeffrey S. Glassman to set up a free and confidential consultation to discuss your rights. Call 1-877-617-5333.